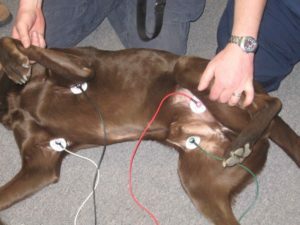 The need for an electrocardiogram of a search canine may arise during a deployment. Situations may include auscultation of irregular beats, dropped femoral pulses, toxin ingestion, severe dehydration, hyperthermia, hypothermia, gastric dilatation-volvulus, respiratory arrest, and cardiac arrest. The EKG units recommended in the FEMA cache list (Life-Pak 12) as well as other units, and automated external defibrillators (AEDs) are adaptable for use in the canines with little to no effort. 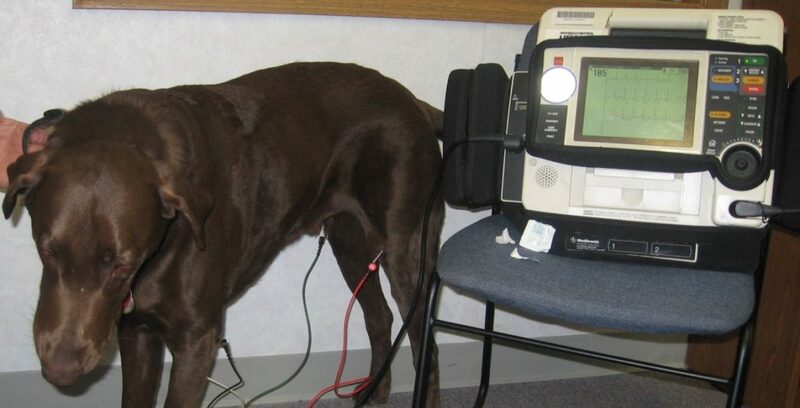 Presented here are two options for acquiring an EKG tracing from canines, as well as a veterinary EKG unit that was purchased with monies from a fund-raiser for the MA TF-1 search canines. MA TF-1 Search and Rescue Canine UBER is not so sure about this! 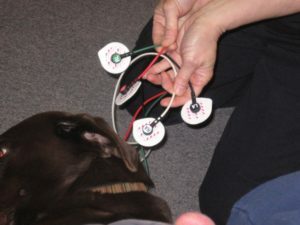 The first option we employed was using the human-designed EKG electrode connectors made to stick to the patient and that use a gel for conductivity. Christmas comes at end of the year. Several medics commented on the negative T waves. In the canine, the T wave (repolarization of the ventricles) may be positive, negative, notched, or biphasic. 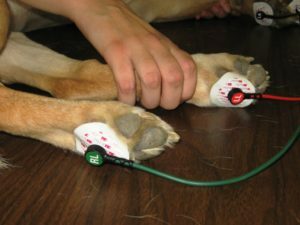 Alternatively, the human electrode lead connectors may be placed on the paw pads. The clips are attached at the posterior cubital joints (elbows) and anterior stifle (knee) or posterior tarsal (ankle) joints. These locations have thickened skin so the canine will be less sensitive to the pinch of the alligator clips. If too harsh, the clips can be fatigued to a looser set point, or the serrated jaws filed down. Alcohol is commonly used as a conduction medium between the leads and the skin. Conduction paste or gel may also be used. 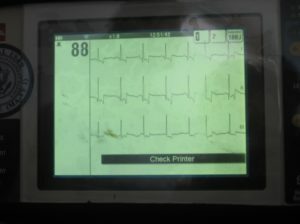 ECG may be stored in memory and reviewed as many times as needed.